The Himalayan owl (Strix nivicolum) belongs to the family of true owls, Strigidae. The Himalayan owl species are distributed in India, Nepal, Bhutan, China, North Korea, South Korea, Taiwan, Myanmar, Thailand, Laos and Vietnam. Until recently these owl species were considered conspecific with Strix aluco. These owls are polytypic species. The Himalayan owl (Strix nivicolum) is a medium-sized bird, measuring 35 to 40 cm in length and weighing 370 to 390 grams. The Himalayan owl appears very similar to tawny owl with some minute differences. It has a round head and lacks ear-tufts. The overall plumage is dark brown with buff, brown and black mottling. The tail is short and strongly barred. There is a diffuse white half collar. The bill is pale greenish yellow. The eyes are dark brown. The talons are pale yellow. The Himalayan owl call consists of two clear, rapid hooting “huhu” sound repeated with a space of several seconds. The Himalayan owl species are distributed in India, Nepal, Bhutan, China, North Korea, South Korea, Taiwan, Myanmar, Thailand, Laos and Vietnam. In India, these species are distributed in the states of Jammu and Kashmir, Himachal Pradesh, Punjab, Haryana, Uttarakhand, Uttar Pradesh, Sikkim, Assam and Arunachal Pradesh. The Himalayan owl nominate subspecies S. n. nivicolum is distributed in India, Nepal, Bhutan, southeast China, north Myanmar, north Thailand, north Laos and north Vietnam. The subspecies S. n. ma is distributed in northeast China, North Korea and South Korea. The subspecies S. n. yamadae is distributed in Taiwan. These Himalayan owl species have moderate forest dependence. These species normally occur in altitudes from 0 to 2350 meters. The artificial ecosystems of these owl species include agricultural fields, pasturelands, plantations, rural gardens, degraded forests and urban areas. The natural ecosystems of these species include tropical and subtropical dry forests, coniferous forests, temperate forests, oak forests, Mediterranean-type shrublands, montane forests and rocky ravines and temperate shrublands. The diet of the Himalayan owl is reported to consist mainly of insects. A variety of insects like mantids, locusts, grasshoppers, cicadas, beetles, moths, termites and also small vertebrates like rodents and birds are their primary food. The breeding season of the Himalayan owl species is believed to be from December to April. These birds are monogamous. Their nesting sites include tree cavities and crevices in rocks. The Himalayan owl species are non-migratory resident birds. Birds in higher elevations may move to lower levels and plains in winter. The global population size of the Himalayan owl (Strix nivicolum) has not been quantified. The overall population trend of these species is reported to be stable. Throughout its range this species is reported to be fairly common. The generation length is 8 years. Its distribution size is about 8,660,000 sq.km. 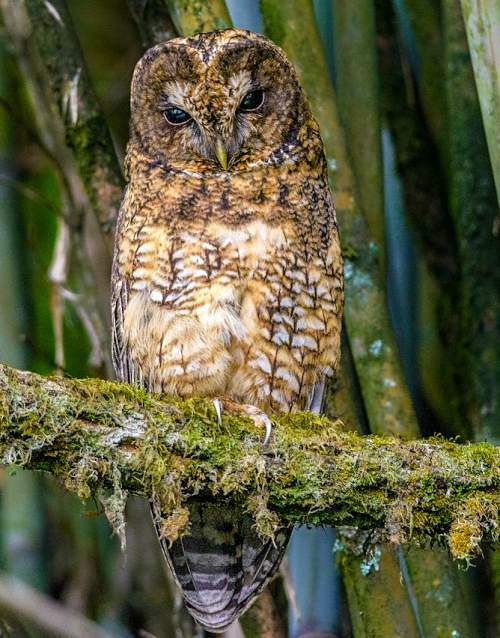 Habitat degradation and fragmentation and capture of adults and juveniles for pet trade are the main threats that may endanger the survival of these owl species. The Himalayan owl (Strix nivicolum) does not approach the thresholds for being Vulnerable, either under the range size criterion, or under the population trend criterion or under the population size criterion. The IUCN (International Union for Conservation of Nature) has categorized and evaluated the owl species and has listed it as of "Least Concern". The CITES (Convention on International Trade in Endangered Species of Wild Fauna and Flora) status is ‘Evaluated’ for Himalayan owl (Strix nivicolum) and listed in Appendix II. The Himalayan owl (Strix nivicolum) is closely related to tawny owl(Strix aluco). The three recognized subspecies of the Himalayan owl (Strix nivicolum) are: Strix nivicolum nivicolum (Blyth, 1845), Strix nivicolum ma (A. H. Clark, 1907) and Strix nivicolum yamadae Yamashina, 1936. Current topic in Birds of India: Himalayan owl - Strix nivicolum.